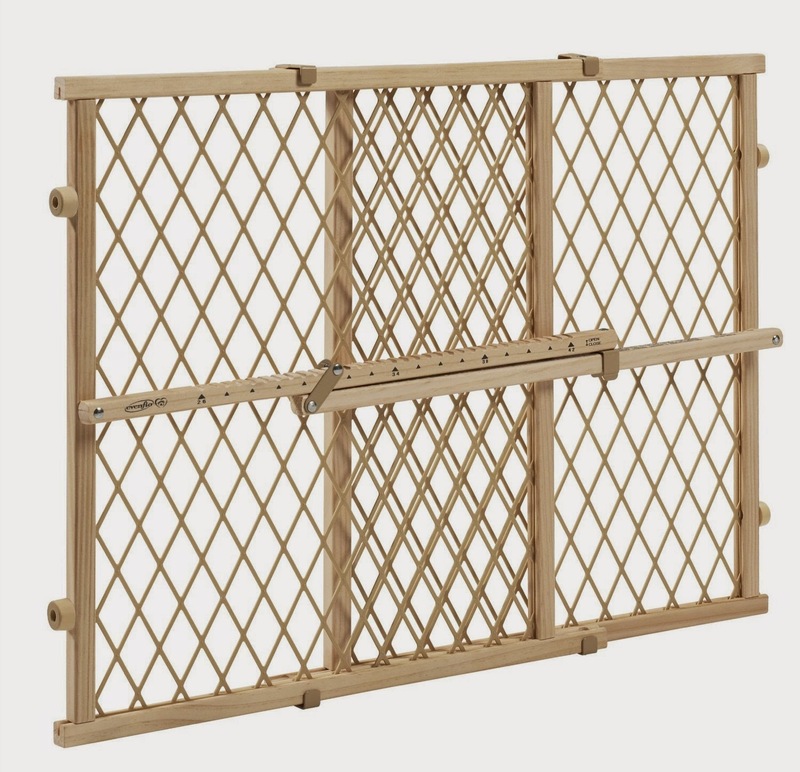 Ever seen one of these baby gates? Of course you have. They're always at yard sales and thrift stores or leaning against the walls of those with small children. Have you ever seen one functioning the way they're supposed to? Nope. So why are they everywhere in such abundance?! Cause they're cheap. The one above is $10 on amazon. And it promises that you don't have to drill holes into your walls. But this thing is full of empty promises. I got one for free from a woman moving - we bought the guest room bed from her and she just kept giving me stuff that she didn't want to take. And I wonder why I have so much crap! I also got a bench from her that I'm redoing right now. But I digress. I could never make this thing wedge against the wall. Wait no, one time I did. One time. After way too much effort. And it was high enough above my baseboards that Wade could almost fit under. Ummm...that defeats the purpose. And immediately after getting it set up we needed to go downstairs and I had to take it down. Grrr. Then I tried just leaning it against the wall and within 5 minutes Wade knocked it over on himself. This thing is supposed to improve the safety in my home. Ghetto! Not ghetto-fabulous, just ghetto. Yes, that is a spare baby mattress and one of my dining room chairs. I'd just slide the mattress back and forth. Looks ridiculous, but it worked well. And Wade loved having a chair to stand at cause places to stand are the best! But part of the minimalism challenge that I'm doing this month is re-purposing stuff. I don't know that it's actually part of the challenge, but I'm making it part. So as I was going through the utility closet I found this leaning against a wall and decided to make it work. I went down to our little local hardware store and got a small piece of 1x2 wood. They had a cut off piece that was the perfect size - so it cost me less than a dollar. We don't have a power saw of any type - which I really need (want) one - but I used our little hand saw and got the job done in about a minute. Each board (stick?) is 18 inches long. Since I knew it was going on the stairs and would lean against the wall a bit, I screwed it on with the front longer than the back. If it were free standing I'd get longer wood and attach it in the middle. Also - I attached the wood close to either end so I could still extend and contract this fairly easily. I can also loosen the screws a little and fold the wood in so it can still store nicely. I might still play with the design a bit, but right away Wade went over to it and it didn't fall on him or fall over! And it opens up the hallway really nicely. And I moved the chair to a less in-the-smack-middle spot so Wade still has a standing post. Cause that's important.